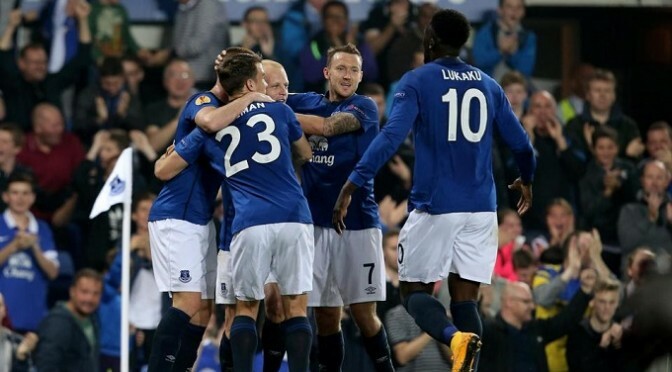 Everton marked their return to Europe with a 4-1 Europa League victory over Wolfsburg at Goodison Park. The Toffeesâ€™ last European campaign came back in 2009-10 when they advanced to the final 32, and they will be hopeful of at least reaching that stage this season after claiming all three points in their Group H opener. They only had to wait for 15 minutes until their first goal with Ricardo Rodriguez turning Steven Naismithâ€™s effort into his own net, while the second came on the stroke of half-time as Seamus Colemanconverted Leighton Bainesâ€™ delivery. Baines struck the third from the penalty spot just after the break, before Kevin Mirallas added extra gloss to the scoreline with a neat finish at the death. Tim Howard looked to have earned a well-deserved clean sheet after making a string of fine saves, only to be beaten by Rodriguezâ€™s excellent set-piece, which proved to be the last kick of the game. There is a long way to go given Evertonâ€™s tricky draw, which has also pitted them against Ligue 1 leaders Lille and Russian outfit Kuban Kranodar, but Roberto Martinez will take much encouragement from this performance.